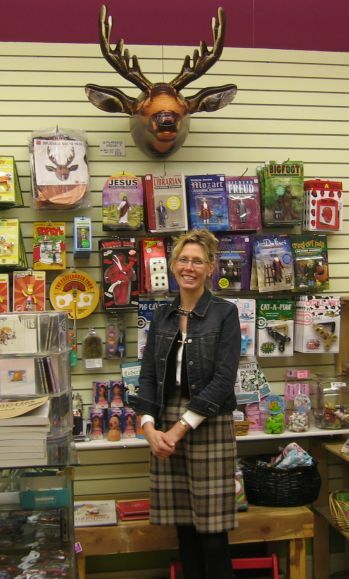 Come join the birthday party, celebrating 10 years of Mary Rossing’s business adventure in Downtown Northfield. Friday, November 30th, 7 to 11 pm, be part of the Present Perfect festivities at the Upstairs Rueb, 503 Division Street. Mary started with an outlet for her studio creations ten years ago in the Nutting Block. She dug in deeper with retail when she rented the former Two Moons space in what is now Fashion Fair. Finally, she made a decision to truly invest in downtown, buying one of the commercial condos in what had been part of Jacobsen’s. Retailing is an excellent creative outlet, according to Mary. Not only is there the window and display designing and product selection and promotion, every day brings problem-solving challenges that often push her creativity to new heights. Mary is always finding new ways to share her many talents with the community. The rumblings of Griff Wigley and the giant cake continue. New rumors of a return of the Shop Local Boys emerge. So, come on down(town), dance to the Zillionaires, eat some cake, have some fun and say Happy Birthday Present Perfect. Thanks Ross, and also we should also note that if it weren’t for the customers coming in and making purchases for 10 years I wouldn’t have a business. It’s a pretty simple concept, but one that we can’t forget. Thanks Northfield for your interest and support!